I hurt all over – could this be fibromyalgia? You bet fibromyalgia is real, even though for many years the medical profession said it did not exist because it did not fit their standard definitions and ideas for how people experienced chronic pain and how to treat it. For many years fibromyalgia was treated badly by being dismissed as though the problem did not exist; that it was imaginary; that some people exaggerated their pain for sympathy. Anyone who experiences lower back pain would have to consider the possibility that the problem stems from fibromyalgia even though back pain is just one small part of the fibromyalgia syndrome. Fibromyalgia is a common and complex total-body pain syndrome in which a person has long-term pain and tenderness to pressure at many sites along the joints, muscles, tendons, and other soft tissues. 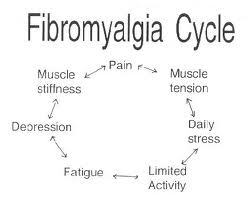 It is typical to experience muscle spasms, fatigue, sleep problems, headaches, stress, depression, mood problems and anxiety in a common case of fibromyalgia. For these reasons it will affect a person not only from a physical standpoint but also mentally and socially. 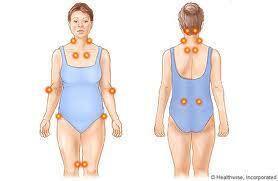 Fibromyalgia is most common among women, from 20 to 50 years old, affecting two to four percent of people. Fibromyalgia is actually a syndrome rather than a disease. A syndrome is a simply collection of particular signs, symptoms, and health problems that tend to occur together, yet they are not related to a specific or known cause. A disease is a specific medical condition with a known cause or causes, with a set of standardized and recognized signs and symptoms. Fibromyalgia, is sometimes called fibromyalgia syndrome, chronic fibromyositis or systemic fibrositis. It is characterized by chronic widespread muscle pain, multiple tender points, abnormal pain processing, sleep disturbances, profound and overwhelming fatigue that is not relieved by rest, and psychological distress. For many years people who expressed the various symptoms of this syndrome were thought to be making up these complaints or were accused of being mentally imbalanced or trying to get sympathy, and were ignored by the medical profession. If treated at all, they were treated not as a physical problem but as a mental problem. Thus, between the widespread symptoms of fibromyalgia and the psychological frustration of having a condition of unknown cause, many of these patients hid their complaints and attempted to suffer in silence. No standard blood work at this time detects fibromyalgia. Fibromyalgia symptoms can start after a large or small physical trauma, surgery, infection or significant psychological stress; sometimes symptoms crop up slowly and progressively with no recognized single triggering event. Chronic widespread body pain that does not respond to traditional medical treatment is the primary symptom of fibromyalgia. People with fibromyalgia also experience moderate to extreme fatigue that is not relieved by rest, sleep disturbances, variable sensitivity to touch, sound and light, and cognitive disturbances. In addition, many will also display other similar conditions with overlapping symptoms: neck and back pain, arthritis, hypothyroidism, irritable bowel syndrome, systemic lupus, etc. The chronic pain of fibromyalgia is described as overwhelming, since it is typically stabbing, shooting pain deep in the muscles and near joints. The pain of fibromyalgia is said to migrate to any and all areas of the body, and to be constant but variable from day to day. Additionally, numbness, tingling, and burning of the extremities are often felt. Early morning pain and stiffness are typical. Pain is aggravated by cold temperatures and high humidity, unsatisfying sleep, physical and mental fatigue, as well as too much or too little physical activity, stress and anxiety. With these unusual pain triggers and traveling nature fibromyalgia pain it is easy to understand why this condition is looked upon as being imaginary by those who do not experience it themselves. The fatigue of fibromyalgia is much more profound than being tired at the end of a busy day. It is said to be an all-encompassing deep and profound exhaustion and lack of stamina that overtakes the body. The fatigue overwhelms the individual and can interfere with all aspects of life – work, marriage, school and society in general. The sleeping disorder of fibromyalgia patients prevents deep, restful, satisfying sleep, and so they wake exhausted and wanting more sleep. While a fibromyalgia patient sleeps constant bursts of awake-like brain activity occurs, preventing them from entering the restorative deep sleep that is needed. There is a long list of additional complaints and conditions that occur in fibromyalgia: vague whole-head headaches and migraine headaches, irritable bowel syndrome, irritable bladder syndrome, restless legs syndrome, inability to concentrate and poor short-term memory, skin sensitivities and rashes as a reaction to common environmental substances, dry eyes and mouth, anxiety, depression, ringing in the ears (tinnitus), dizziness, vision problems, Raynaud’s Syndrome, and impaired coordination. The exact cause of fibromyalgia remains a mystery, but the progress of fibromyalgia is that the condition is now accepted and recognized as legitimate. Most researchers opine that fibromyalgia is a disorder of central nervous system in which there is disorganized and improper regulation of several of the chemicals (cytokine, serotonin, tryptophan, etc.) that make the nerve system function. Another way of saying this is the cause of fibromyalgia is disordered sensory processing, as a result of altered brain chemistry. This causes pain signals to be increased or amplified as sensory messages are received by the brain. It can be said that the person with fibromyalgia feels more pain than the next person because their nerves systems are geared to be more sensitive; they have an abnormal pain perception because their nerve chemistry is not right. Further, this chemical imbalance within the nerve system seems to have a genetic component as well. Change in life is always difficult. One of the best forms of fibromyalgia treatment at this time is for the patient to understand and accept the need for changes in their lifestyle so as to adapt to their altered pain perception. Standard medical treatment for fibromyalgia is only a small part of what is needed to control and minimize the disturbing pain, sleep and psychological symptoms. Alternative treatments, such as diet and nutrition, exercise and relaxation techniques, have a large role in fibromyalgia treatment. Since few doctors are able to provide all these services and areas of expertise, the fibromyalgia patient should create a network of different doctors and specialists within alternative medicine to provide whatever care is needed. A growing number of prescription drugs are available for fibromyalgia treatment, such as pregabalin (Lyrica®), duloxetine (Cymbalta®) or milnacipran (Savella®). A number of non-narcotic pain relievers ( tramadol) or reduced dosage of antidepressants (tricyclic antidepressants, serotonin reuptake inhibitors) or benzodiazepines, also mitigate pain. Lidocaine injections, light exercise and gentle stretching maintain muscle tone while reducing pain and stiffness. Better sleep can be developed over time by following a healthy sleep routine; going to bed and getting up at the same time daily; not waiting to become exhausted before going to sleep; improving the environment of the bedroom; avoiding alcohol, caffeine and refined sugar prior to bedtime; doing light exercise daily; practicing relaxation techniques prior to bedtime. Following a program of emotional support that improves communication with family and friends; participating in a fibromyalgia support group; participating in professional counseling sessions; concentrating on what is good in life and not only the problems. Complementary therapies are helpful when used in a comprehensive and customized fibromyalgia treatment program: therapeutic massage, myofascial release therapy, chiropractic manipulation, water therapy, light aerobics, light acupressure, alternating hot /cold packs, yoga, acupuncture, relaxation exercises, breathing techniques, aromatherapy, cognitive therapy, biofeedback, herbs and nutritional supplements. Consider fibromyalgia as a possible explanation for the low back pain and neck pain you might be having if you have variable pain in other parts of your body and other symptoms of this syndrome.